We continue also our international journey: in the next interview we ask somebody again, who did her personal best season last winter: the member of the always-smiling team USA, Annelies Cook! Annelies, you did a wonderful season: 3 times top 20 places, 45th in the overall ranking: did you expect such a successful winter in November? Placing in the top 20 was something I had dreamed about for a long time but it wasn’t a goal this year until I saw that I was skiing well enough that it could be possible. I thought to make top 20 I would have to have a perfect biathlon race, so it was very exciting to acomplish this with misses in shooting. I did not expect to have such a big jump this year even though I knew that I was in good shape. You had fantastic races in Sochi, mainly in the individual: this was the first time in your career when you had real chance to reach even the podium (you were 4th after 3 shootings). What did you feel during the race and before the last shooting? I like racing at altitude and I just tried to keep good techique the entire race and stay steady, it was a hard race but I don’t mind just putting my head down and working. I had been working on some shooting things for the past few weeks and I was just so happy that I was doing a good job. When I came into the last shooting, I knew I had a chance to have a good day (I didn’t know how good though) and I thought too much and had a typical biathlon day. I was lucky because my coaches didn’t tell me how well I was doing, so I didn’t know I could have had a medal until I was skiing my last loop. I was still really happy to place 14th because it was my best result ever. Your development was clear in this winter – what are the goals for the next one? Maybe to reach a top 10 position? My goals are just to keep on working on all the same things. I think now I have more ideas about shooting psychology that I should work on so that if I am having a great shooting day like in Sochi, I can hit those last three targets and not mess it up. I want to keep having as much fun as I can while working really hard too. The American team becomes better and better – you showed it in the WCH in the mixed relay, where you reached a great 8th place (without Tim Burke) only 1:30 back from the winner. It is in the Olympic program, do you think can it be even better? Our team has been slowly developing over the last ten years. It takes a long time to develope, especially in the U.S. where not very many people know about biathlon or compete in biathlon. You have to take the people that you have and make them as good as possible. We will keep doing the same program and making steps in the right direction. I don’t think we wil make any big changes, except in believing in ourselves even more. Our team leader says a happy team is a fast team. For Americans, it is important to enjoy this lifestyle. We don’t make a lot of money doing biathlon, so we have to do it because we love it. Our team is like a family and we have all known each other for a very long time. We also stay in Europe for the entire winter and don’t get to go home, so we have to find the joy in it. Nobody really knows about biathlon in the U.S.. American’s like team sports the best and alpine and figure skating are the most popular winter sports other than hockey. Even cross-country skiing is more popular than biathlon. 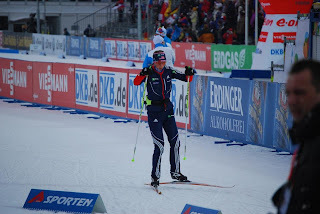 There are only a few of us who do biathlon so that makes it even more difficult to find success. I DO remember the Hungarian fans from WCH. 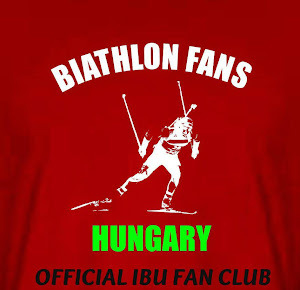 We all love fans who have a good time and really love the sport of biathlon. We are happy that you enjoy the spectacle.